Here’s the second Tweetinar! It’s more than 320 social media insightful tweets! On March 10th I launched my second Tweetinar, “Social Media – The BIG Picture” based on Part Three of my book. This “Tweetinar” delivered social media insights three times a day, five days a week at 10:00 AM, 12:00 PM, and 2:00 PM, Monday through Friday, and runs all the way through SEPTEMBER! If you missed any of my first Tweetinar I will share those social media insights with you in each of two, bloginars. The fifth 60+ social media insights are below. Be sure to RSS this blog or check back soon for the final 60 tweets to complete your Five Steps To Social Media Success bloginar. Also remember to follow my tweets for more social media insights and the biggest Tweetinar yet! If you want to see more than 120 insightful social media tweets, check out my very first ever Tweetinar, “Social Media – The BIG Picture” based on Part One of my book here in my blog! 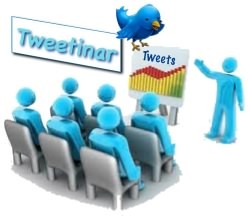 • Train existing staff member to perform only one task; Tweet, Facebook, blog, etc. • Have them write the blogs, write the tweets and have Marketing, PR & Legal look first. • Refer back to Step 1. What wasn’t working, take the human & financial resources from there. • When I did this for one of my companies, I found direct mail to be abysmal! A BAD COCA! • I took the time, help, and $’s from that and poured it into social media with a better ROI! • Now, every 1/4 I have a new budget of money and people to use on social media. • Finding these new resources is the importance of performing Step 1! • Social media has no hard costs, and an inordinate ROI. • ALSO: you can use temps, college students, eLance, Craig’s List, and interns. • “Intern” is Latin for “herding cats”. Set them up, watch them, and their free! • Interns want to help, they want to please, they are intelligent, and almost always free. • Hire and train new staff if you have the budget. • Whether it new or existing staff, they will need training on corporate message and voice. • Warning: Millenniums understand the technology, but don’t have the corporate experience. • Out House: Marketing & PR firms, consultants, service agencies can help. • Warning: Be wary of ANYONE calling themselves a Social MEdia Expert! • It took me more than 800 pages to define social media. None is an expert on all that. • I would never have learned all that if I weren’t contractually obligated for the book. • College students are awesome! Call your local college and ask for the dean of Communications. • Ask the dean to recommend their brightest student. Job placement makes them look good! • Once I did this and that student became my VP of Engineering for nearly 10 years! • eLance is a web site for freelance experts who compete between themselves for your project. • With unemployment so high, there are hundreds of over qualified experts willing to work for you for pennies. • Many can write blogs, do research, write articles, create Tweets. or implement your work. • I asked one Fortune 500 company I worked with if they had a company blog site. They said Yes. • I asked if their employees were using it. They said no, not one. • I asked if their employees were blogging elsewhere. They said 6,000. • Your employees will blog with or without your help or encouragement. • Your employees work 40, 50 hours a week for your company. They want to talk about it. • You employees are the best sales people that you could have! They’re passionate! • These people are dedicating their lives to building your company. Give them a voice! • Just coach them about SEC rules, legal implications, and IP (Intellectual Property) concerns. Be sure to RSS this blog so you don’t miss a single insight… And follow me on Twitter @LonSafko!